Our four Automated Side Loading (ASL) trucks service about 20,000 residential customers each week. That heavy schedule means they must be replaced every 5-7 years. With two ASL trucks scheduled for replacement this year, we were fortunate to have a U.S. Department of Energy grant to apply toward the E3, which could pay for itself in fewer than five years. E3 is a trendy acronym that stands for environmentally-friendly, energy-efficient, and economical. The innovative Autocar E3 stores energy from braking to supplement the power of the diesel engine, resulting in dramatic fuel savings and significantly reduced emissions. The E3 could become a leading force in the refuse business because it’s greener, cleaner, more efficient, more economical and more reliable than just about any other truck on the road. Lower Operating Costs: An advanced series hybrid drive, RunWise® captures brake energy while engine decoupling allows for engine management, which lessens the engine’s demand for energy and fuel. RunWise’s cradle design allows for simple and fast removal from the chassis when it needs service. Less Brake Wear: Brake energy recovery converts vehicle inertia into stored energy instead of wasting it through brake heat and wear. Not only does this improve fuel economy, it can also extend brake life by up to eight times, resulting in less down time and lower maintenance costs. Lower Emissions: RunWise contributes to a greener planet by reducing CO2 emissions by up to 38 tons per year, which the U.S. Environmental Protection Agency says is like removing 6.7 mid-sized cars from the road or planting 1,500 trees. 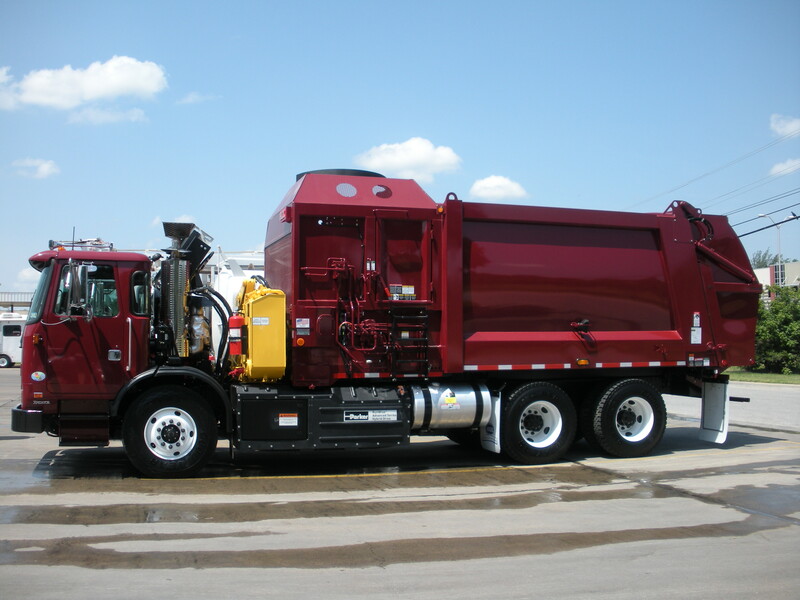 Reduced Fuel Consumption: Average annual fuel consumption for a typical refuse truck is about 10,000 gallons per year. Depending on route density and operating conditions, RunWise can reduce fuel consumption by 30-50 percent. In addition, vehicle acceleration can improve by more than 20 percent. Those are substantial improvements by any measure. Better Drivability: Enhancements such as improved acceleration, less and smoother shifting and reduced brake fade enable Runwise operators to complete collection routes in less time and with fewer trips to the fuel pump. Operators who have driven a RunWise-equipped refuse truck also say they are a pleasure to drive. If you happen to see this shiny new maroon vehicle collecting garbage in your neighborhood, you can take pride in the fact that it’s not only being easy on our environment, it’s saving your tax dollars. What do you think about the latest addition to the city’s fleet? This entry was posted on June 12, 2012 by City of College Station. It was filed under Green CS, Public Communications, Public Works, Sustainability and was tagged with garbage trucks, green, hybrid, public works, sanitation, sustainability.